The joint venture between commercial vehicle maker Ashok Leyland and Japan’s Nissan Motors will roll out its first product by middle of 2010. 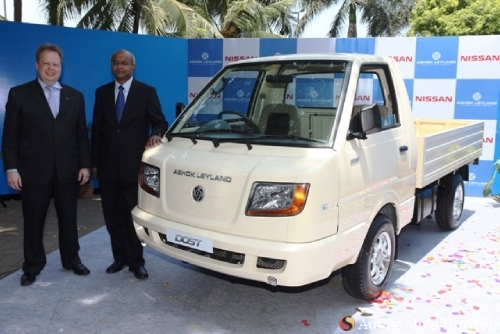 “We will be rolling out the first product by mid-2010 in two versions – a 1.25-tonne diesel truck, which will also be our first LCV (light commercial vehicle),” said Ashok Leyland managing director R. Seshasayee. The other product will be a two-tonne truck, Seshasayee told reporters here on the sidelines of the annual convention of the Society of Indian Automobile Manufacturers (SIAM). The launch of the two vehicles has been delayed because of a “delay in the allotment of land (for a Chennai facility) by the government of Tamil Nadu”. His company would also going to display an “electric and hybrid-electric” product at the Commonwealth Games here next year, Seshasayee said.